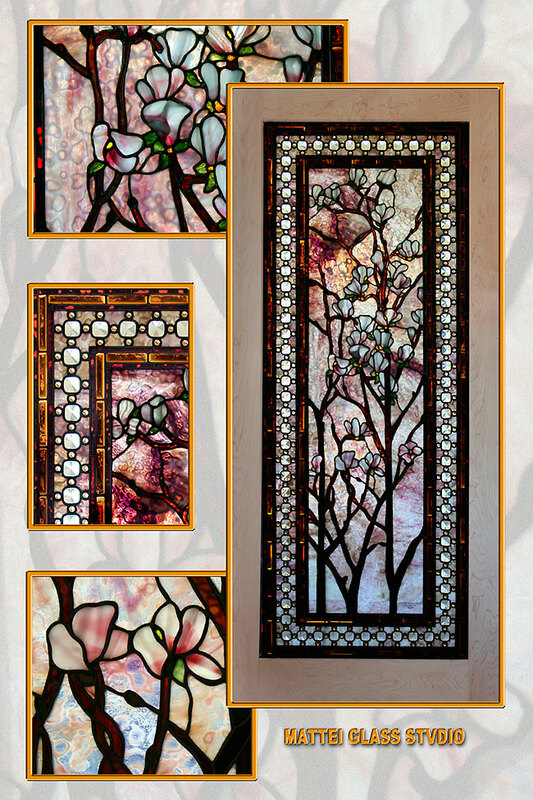 This stunning Magnolia panel utilizes custom rolled drapery glass for the flower petals and hand-rolled, ring mottled sheet glass for the field, this extraordinary work of art required almost 3,000 hours to complete. My small scale studies required the pink/purple glass in the field to not simply color phase from top to bottom but for the color phase to undulate throughout the window. The field of magnolias is enhanced by 2 borders of dark amber beveling interspaced with a border of sculpted, clear beveling set in a continuation of the background, field glass.